A year ago we were in full Super Bowl XLIX recovery mode, packing up Super Bowl Central, resetting bars and restaurants, and unclogging our asphalt arteries. Those were good times. This Sunday, Feb. 7, Super Bowl 50 is the Bay Area’s gig, leaving us Phoenicians to simply kick back with a cold one and enjoy the game (and all the gluttony and commercial hoopla that goes along with it). 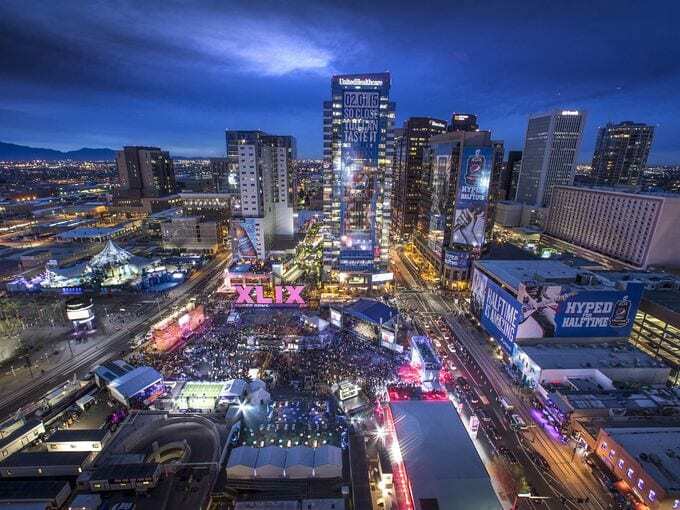 If your man cave hasn’t quite made the jump to high def, and the right party invite has proven elusive, here are six ways you can enjoy Super Bowl 50 in Downtown Phoenix. 1. Crescent Ballroom – Our friends at Crescent are throwing a Super Bowl party they’ve dubbed “Hamms Me the Ball!! !” a celebration of the cheap, St. Paul, Minn.-born beer featuring the funny bear, and good times bolstered by chips, dips, poppers and cool peeps. Watch the game in the lounge on the big screen or just hang out with cool kids while sipping $5 Mimosas or Four Peaks bottles. This Super shindig starts at 3 p.m. and admission is free. 3. DeSoto Central Market– DeSoto Central Market and its family of restaurants are hosting a Super Bowl Pig Roast featuring all-you-can-eat hog (+ a variety of fixins) starting at 2 p.m. Come early for tailgating games on the patio before gorging on a 200-pound pig roast. Food tickets are $25 at the door, and there will be vegan/vegetarian options abound. 4. Rose & Crown – It’s not just a soccer bar! The charming lads over at the R&C will be showing the game indoors and out on the patio, so come early and stake out your favorite picnic table. The forecast calls for sunny skies and a high of 79 degrees. No cover. 5. Hooters – It’s a Football Frenzy at Hooters Arizona Center, where from 11 a.m. to 6 p.m. football fans can take advantage of $4.50 domestic Big Daddies, $5.50 Blue Moon and Heineken Big Daddies, $5.49 Fried Pickles or Tots, $8.49 Sliders plus, the most killer deal, 20 Hooters wings and two domestic Big Daddies for $19.99. Belly up, cover free. 6. Tilted Kilt – The staff at Tilted Kilt CityScape are inviting all Downtowners to watch the game from their TV-rich nest, complete with awesome city views and more food and drink deals than you can shake a bagpipe at. No cover. Enjoy the last football game of the season (welp) responsibly, readers.